The Smart City Brake Support (SCBS) system is designed to reduce damage in the event of a collision by operating the brake control (SCBS brake) when the system's laser sensor detects a vehicle ahead and determines that a collision with a vehicle ahead is unavoidable. It may also be possible to avoid a collision if the relative speed between your vehicle and a vehicle ahead is less than about 20 km/h (12 mph). Do not rely on the Smart City Brake Support System (SCBS) as a substitute for safe driving: The Smart City Brake Support (SCBS) system cannot compensate for unsafe and reckless driving, excessive speed, tailgating (following another vehicle too closely), and driving on slippery roads such as wet, snowy, and icy roads (reduced tyre friction and road contact because of water on the road surface). You can still have an accident. The Smart City Brake Support (SCBS) is a system which operates in response to a vehicle ahead. The system may not be able to detect or react to two-wheeled vehicles or pedestrians. The laser sensor for the Smart City Brake Support (SCBS) system is installed near the rearview mirror. To assure the correct operation of the Smart City Brake Support (SCBS), heed the following cautions. Do not apply stickers to the surface of the windscreen near the laser sensor (including transparent stickers). Otherwise, the laser sensor may not be able to detect vehicles ahead which could result in an accident. Do not apply coating agent to the windscreen. Otherwise, the laser sensor may not be able to detect vehicles or obstructions in front which could result in an accident. Do not disassemble the laser sensor. If cracks or damage caused by fl ying gravel or debris is visible near the laser sensor, stop using the Smart City Brake Support (SCBS) system immediately and have your vehicle inspected by an expert repairer, we recommend an Authorised Mazda Repairer. If the vehicle continues to be driven with cracks or scratch marks left on the windscreen near the laser sensor, the system may operate unnecessarily and cause an unexpected accident. Refer to Stopping The Smart City Brake Support (SCBS) System Operation on page 4-128 . When replacing the windscreen wipers or windscreen, consult an expert repairer, we recommend an Authorised Mazda Repairer. Do not modify the suspension: If the vehicle height or inclination is changed, the system will not be able to correctly detect vehicles ahead. This will result in the Smart City Brake Support (SCBS) system not operating normally or mistakenly operating, which could cause a serious accident. Turn off the Smart City Brake Support (SCBS) when the vehicle is running on a chassis roller or being towed: Turn off the Smart City Brake Support (SCBS) system to prevent mistaken operation when the vehicle is running on a chassis roller or being towed. See the next page on how to turn off the Smart City Brake Support (SCBS). When driving off-road in areas where there is grass or forage, it is recommended that the Smart City Brake Support (SCBS) system be turned off. Always use tyres for all wheels that are of the specifi ed size, and the same manufacturer, brand, and tread pattern. In addition, do not use tyres with signifi cantly different wear patterns on the same vehicle as the Smart City Brake Support (SCBS) system may not operate normally. The laser sensor includes a function for detecting a soiled windscreen and informing the driver, however, depending on the conditions, it may not detect plastic shopping bags, ice or snow on the windscreen. In such cases, the system cannot accurately determine a vehicle ahead and may not be able to operate normally. Always drive carefully and pay attention to the road ahead. The Smart City Brake Support (SCBS) system will not operate if the driver is deliberately performing driving operations (accelerator pedal and steering wheel). The Smart City Brake Support (SCBS) system will operate under the following conditions. The Smart City Brake Support (SCBS) warning light (amber) does not illuminate. The vehicle speed is between about 4 to 30 km/h (2 to 18 mph). The Smart City Brake Support (SCBS) system is not turned off. The DSC is not malfunctioning. Refl ection of the laser is poor due to the shape of the vehicle ahead. The vehicle ahead is signifi cantly dirty. Under bad weather condition, such as rain, fog and snow. The window washer is being used or the windscreen wipers are not used when it's raining. The steering wheel is turned completely left or right, or the vehicle is accelerated rapidly and comes close to the vehicle ahead. Trucks with low loading platforms and vehicles with an extremely low or high profi le. Under the following conditions, the Smart City Brake Support (SCBS) system may not operate normally. Heavy luggage is loaded in the luggage compartment or on the rear seat. If there is the possibility of partial contact with a vehicle ahead. Exhaust gas from the vehicle in front, sand, snow, and water vapour rising from manholes and grating, and water splashed into the air. When towing a malfunctioning vehicle. When driving with tyres having signifi cantly different wear. 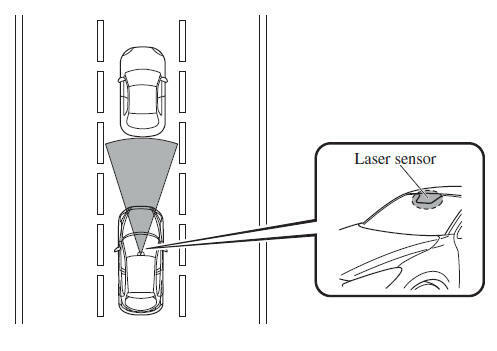 In the following cases, the laser sensor may inadvertently determine that there is a vehicle ahead and the Smart City Brake Support (SCBS) system may operate. Objects on the road at the entrance to a curve. Vehicles passing in the opposite lane while making a curve. When passing through a toll gate equipped with a bar. When passing under a vinyl curtain or fl ag. Plastic objects such as pylons. Two-wheeled vehicles, pedestrians, animals or standing trees. (Manual transaxle) If the vehicle is stopped by the SCBS operation and the clutch pedal is not depressed, the engine stops. When the system operates, the user is notifi ed by the fl ashing Smart City Brake Support (SCBS) indicator light (red) and the active driving display * . The Smart City Brake Support (SCBS) warning light (amber) turns on when the system has a malfunction. If the Smart City Brake Support (SCBS) is operating, the indicator light (red) fl ashes. “SCBS Automatic Brake” is displayed in the active driving display while the SCBS brakes or the brake assist (SCBS brake assist) is operating. The collision warning beep sounds intermittently while the SCBS brake or brake assist (SCBS brake assist) is operating. If the vehicle is stopped by the SCBS operation and the brake pedal is not depressed, the warning beep sounds one time after about 2 seconds and the SCBS brake is automatically released. The Smart City Brake Support (SCBS) system can be temporarily deactivated. When the Smart City Brake Support (SCBS) system is turned off, the Smart City Brake Support (SCBS) OFF indicator light turns on. When the engine is restarted, the system becomes operational. Press the SCBS OFF switch to turn off the system. The Smart City Brake Support (SCBS) OFF indicator light in the instrument cluster will illuminate. Press the switch again to turn the system back on. The Smart City Brake Support (SCBS) OFF indicator light will turn off.